Gemara: One who tightens the thread of fabrics [that were already sewn together but became loosened – Rashi] on Shabbat, requires a chatatoffering [for atonement for violating Shabbat]. Ein Ayah:The character of melacha(forbidden work on Shabbat) does not depend on its external form, i.e., the amount of force that a person must expend to complete it. Rather, it depends on its internal character, or its spiritual form, i.e., the qualitative improvement to the object to which it relates. It is true that the two elements are usually interconnected. In other words, melachathat brings some significant embellishment also requires significant physical action by a person. However, this correlation is coincidental. If it turns out that an activity has the qualitative requirements of a melachawithout involving significant physical action, nothing is detracted from its status in regard to the laws of Shabbat. Indeed the consequences for one who does a melachaon Shabbat are a function of the melacha’squalitative, even spiritual, quality of that which is accomplished. When one tightens a thread that forms the stitches in fabric, he rarely has to use noteworthy force. Nevertheless, it contains a full status of melacha, as it improves a garment, whose various fabrics start separating from each other if the thread has not been tightened. That is why there is a need for a chatat offering. Gemara: One who learns even one thing from an amgosh (a negative person, whose specific fault is the subject of a subsequent gemara) is deserving of death. Ein Ayah: When the human spirit delves, with all its depth, thought, feelings, desires, and imagination, into the depths of animalistic coarseness, it sets many and deep paths of darkness. The general approach that the paths of darkness employ is to bring the desired “peace” between a person’s evil and lowly tendencies and between his good and lofty tendencies by “killing” the positive tendencies and having the negative ones take control over all of a person’s totality. From there darkness takes over the world. The phenomenon of the amgoshsets the stage for idol worship, and his ways are very complex. Sometimes such a person has positive things to offer and can teach things that are useful. However the characteristic of the amgoshimprints on everything in which he is involved with venom. Thereby, anything that comes within his domain will cause an increase of darkness and allow a person’s lowly animalistic elements to cause him to be brash and have his side of chutzpa prevail. Even the smallest measures of intellectual attainment that come from such a destructive source have venomous impact. They strengthen a person’s excitement with that which his evil inclination presents in a way that grows and grows in severity. One who learns from an amgoshthus leads himself away from the proper paths of life. "Ya’akov was frightened and distressed". 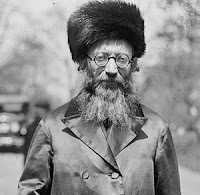 HaRav Nachman Kahana: Remember, do not forget! Any Difference Between Netanyahu and Bennett? "Ya’akov got up early in the morning"
Is President Trump bad for the Jewish People?